So often in this post-op WLS journey, we use before and after photos to document our progress and to celebrate our losses. I know that these types of photos are important to me because they serve as motivation for days when the scale doesn’t read the way I want it to. They help me remember that one day doesn’t define the entirety of my entire path, and that my hard work is not in vain. There is another type of before and after photo I’d like to share with you. Tonight we went to the mall and walked around for a good little bit, and then I did a little shopping. During the past year, I saved a dollar each week and increased the dollar amount each week until I got to $52 saved in the last week. This is the pattern I followed. I started it at the beginning of the year last year because I knew that by the time I’d saved it all, I would be in need of a new wardrobe. Thankfully, the confluence of crazy good sales AND the end of the year happened at the same time I needed to buy clothes AGAIN. So I’ve been taking advantage of the fact that I now have a wad of money to buy clothes with and that they’re all on sale. I’m going to do it again this year, except I’m going to do the savings backward–save the larger quantities of money earlier in the year when I am better able to afford to save it, as the last third of the year is the most expensive for me. As I went from store to store, I had a couple of realizations. First, I didn’t need to buy something simply because it fit. I have finally come to the realization that if I don’t absolutely love it, it isn’t worth taking up space in my closet. How many times in the past did I buy something just because it fit, and not because it really looked good or I really liked it? Second, I can now afford to be choosy about what I wear and how I dress. This is because now I actually have choices about what I can wear. I am no longer confined to shopping at Lane Bryant for everything, nor am I relegated to shopping exclusively online for things. Hell, I remember a time when I was excited to be able to shop at Lane Bryant again because I’d lost enough weight in my last go-round at weight loss (via Weight Watchers) that I could finally get into their sizes again. And now I’m excited that LB is no longer my sole fashion choice. I am simultaneously excited and in sensory overload because now I have so many more choices that I’ve got to unlearn the “buy it because it fits” mentality quickly because I’m afraid I’ll buy things because they’re a certain size or a certain brand. Tonight I bought a pair of Lucky Brand jeans. Never in my life did I think I’d ever be able to wear something from there. Mind you, they haven’t always had plus sizes, but thank goodness their marketing folks finally woke up and realized that big girls like looking nice and want to wear premium denim too, because the jeans I bought tonight fit like a glove. I nearly cried in the fitting room, because the pair I tried on was a 24. And it was too big. Significantly so. A year ago, I would not have been able to even slide my thigh past the knee of the jeans I bought. I would not have been able to pull the sweatshirt I bought tonight past my shoulders or fit my arms through the arm holes. 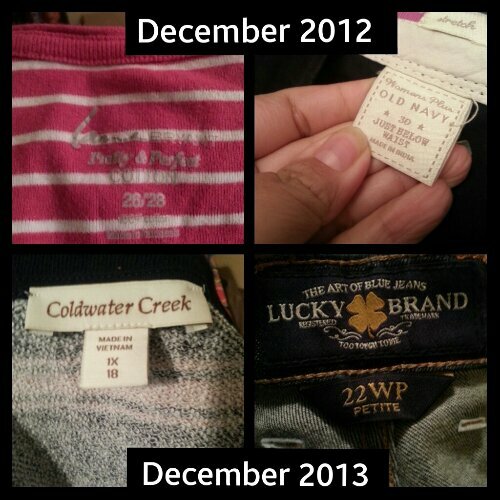 I was wearing pants in a tight 30W, and shirts in a tight 26/28 (if they were knit; so much more forgiving, you know). I didn’t have button-up shirts because there weren’t any that fit around my belly and that could accommodate my upper arm flab. The picture below shows you a different kind of before and after. I think it’s important to see non-physical aspects of the effects of this surgery. This picture is a direct result of the surgery combined with my hard work, and dammit, I’m proud of it. Today was day two of carb clampdown, and I think I did a pretty good job. I did drink a cup of chocolate milk this morning, where most of my carbs came from. The rest of my carbs came from veggies and the sugars in the jerky I ate. I was a protein beast today, though, getting in 97 grams. Carbs were good at 32 grams, and my fat grams were low as well, at 21 grams. I ate quite a bit of veggies today as I miss them a lot. I think I’m going to try and shift my eating such that my planned snacks are veggie based, and my main meals are strictly protein. I may give this a try next week to see how it goes. I love, love, love vegetables and really want to get more of them into my eating but it’s tough when you aim for 80 grams of protein each day and try to stay at around 900 calories. I should also mention that I had jerky at the movies and a liter of water instead of giving in to the temptation of the freshly made popcorn they were serving up. I’d call that a win. 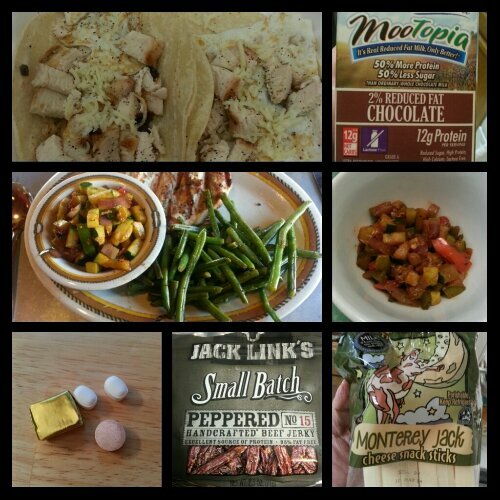 Today’s food choices, from upper right: 1 cup Mootopia chocolate milk; sauteed squash, onions, peppers and zucchini; Trader Joe’s Monterey jack cheese stick; Jack Link’s peppered beef jerky; multivitamin and calcium supplements x2, iron supplement; grilled chicken breast, sauteed squash, onions, peppers and zucchini, green beans; egg whites, grilled chicken breast, black beans and Monterey Jack cheese taco guts (tossed the corn tortillas). This entry was posted in being thankful, celebrations, daily bites, eating, la guerra, little things, NSV's, post-op, success, the sleeve, vsg, weight loss surgery, werk! and tagged before and after, benefits of wls, daily bites, eating, little celebrations, NSVs, oh behave!, planning for success, plus-size fashion, post-op eating, post-op life, sleeve gastrectomy, sorry for sleeve rocking, success, things of win and awesome, VSG, vsg realness, werk!, WLS. Bookmark the permalink. Those pictures are very impressive! Really mind-blowing! And it only gets better! I remember how it felt when I found myself fitting into a size 8 (after starting at a size 20) – it was mind blowing! I love your approach of protein only meals and veggie snacks – I think I’m going to try that …. as I begin to “detox” from carbs today! lol! Happiest of new years to you – continue to enjoy all those amazing NSV’s! This is just inspiring this is the type of posts that motivation people like me. Glad to know it! I hope I can be a good source of inspiration for you as you start your way through this process too.